Custom made gold grillz, gold teeth and diamond grillz made from real solid white, yellow and rose gold. Gold grillz are usually made on 6 teeth but you can choose any number starting from one single gold tooth. We craft custom made gold grillz made from yellow, white, rose gold and platinum. For gold grillz we can use dental gold, 10k gold, 14k gold, 18k gold; it's your choice, just tell us when you order. 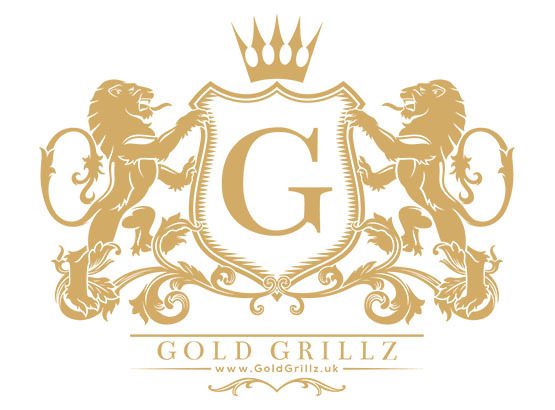 Please note the price of the gold grillz will vary depending on the gold used and its style. Have your gold grillz encrusted with diamonds to have that diamond smile. We use real VVS OR GVS diamonds, as many as we can fit into your gold grillz, depending on your teeth size. All our diamonds will never fade or come off because we lock them into your gold grillz. We don't trim your teeth in any way because we craft our grillz very thinly. The gold grillz clip on to your existing teeth or can even replace any missing teeth. We give you two options: Clip-On Grillz which you can take in and out whenever you like or Stuck-In Grillz which are glued to your existing teeth and must be removed every 6 months for cleaning and repolishing. The metal we use for your teeth grillz is real solid gold so it will not tarnish or change colour easily and will remain shiny for a very long time. "Gold - the ultimate form of safe money - will always skyrocket." Choose from the options available for each individual tooth or grillz. Payments are processed by Sage Pay or PayPal. After payment has been made we will send you the mould kit with all the intructions on how to take the impressions of your teeth. Please follow the instructions carefully as we need the mould of your teeth to be as accurate as possible. Send the mould of your teeth back to us in the bag provided, wrapped securely, so nothing can damage it. "Because gold is honest money it is disliked by dishonest men."